Born on this date in 1960, Vladimir Krutov was a member of the famed KLM line, along with Igor Larionov and Sergei Makarov, which dominated Soviet and international hockey the 1980's. "Volodya was such a dependable and steadfast man that I would have gone anywhere with him - to war, to espionage, into peril. There are fewer and fewer guys like him in every generation of hockey players," former Soviet goaltender Vladislav Tretiak told the Sport-Express newspaper at the time of the passing of Krutov in 2012. 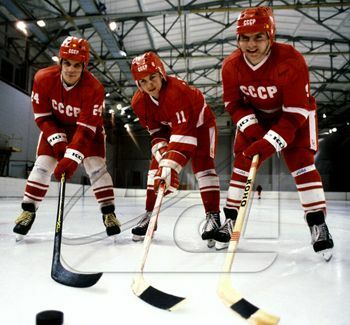 Krutov, a left winger, was a member of the famed KLM line along with Larionov and Makarov which dominated Soviet and international hockey the 1980's. Krutov played for CSKA Moscow (better known in North America as Central Red Army) beginning with one game in 1977-78 and a half season of 24 games the following year,including scoring his first goal, before becoming a full time member of the Red Army squad in 1979. That season, in 40 games, he would average more than a point per game with 30 goals and 12 assists for 42 points. 1981-82 would see Krutov set a personal high with 37 goals and 66 points in 46 games and was Red Army's leading scorer with 53 points in 1982-83. CSKA would win the Soviet League championship in each and every of Krutov's 12 season's with the club. 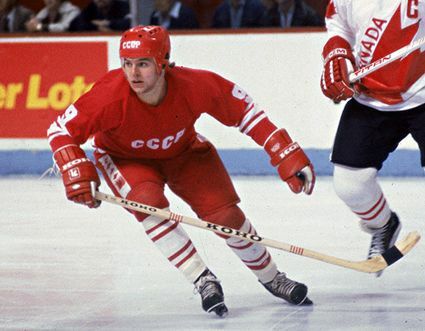 Additionally, he led the league in goals in 1984 (37 goals), 1986 (31) and 1987 (26) and was named to the USSR All-Star Team every year from 1982 to 1988 and was the Soviet Player of the Year in 1987. His final career totals with CSKA were 438 games played with 288 goals and 215 assist for 503 points, which still ranks him 5th in team scoring, 7th in goals and 4th in assists over 20 years later. In addition to his 12 Soviet League championships, Krutov and CSKA would win the Soviet Cup twice, in 1979 and 1988, and the European Cup in each of his 12 seasons. While with CSKA, Krutov also toured North America as part of the Super Series, a series of exhibition games between Red Army and other Soviet club teams taking on various NHL teams. He participated in the Super Series three times, in 1982-83, 1985-86 and one last time in 1988-89, playing a total of 17 games, scoring 10 goals and 21 points. His Soviet League success was duplicated in international play as well, beginning with a silver medal in his international debut at the 1978 European Junior Championships and a pair of gold medals in the World Junior Tournament in 1979 and 1980 while leading the World Juniors in scoring both years with 14 points in 6 games in 1979 and 11 points in 5 games in 1980 while being name Best Forward both times as well. 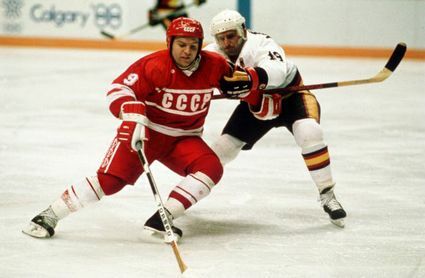 Krutov's senior international career began with a silver medal at the 1980 Olympic Games (he scored the first goal of the "Miracle on Ice" game and later added an assist to give the Soviets a 3-2 lead) prior to a run of five consecutive gold medals at the 1981 World Championships, the 1981 Canada Cup, the 1982 and 1983 World Championships and the 1984 Olympics. A third place finish in the 1984 Canada Cup and a bronze medal in the 1985 World Championships followed. 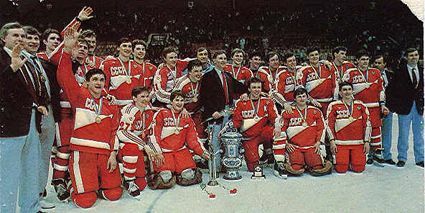 The Soviet Union would rebound with another gold medal at the 1986 World Championships, where Krutov was named Best Forward. 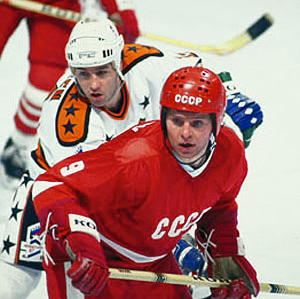 In 1987, Krutov scored two goals in the 5-3 Soviet win in game two of Rendez-vous '87 against the NHL All-Stars before earning a silver medal at the 1987 Worlds, were Krutov led the tournament in goals and points and was named Best Forward for the second consecutive year. Later that year, he participated in the 1987 Canada Cup where he was named to the All-Star Team as the Soviets finished second. 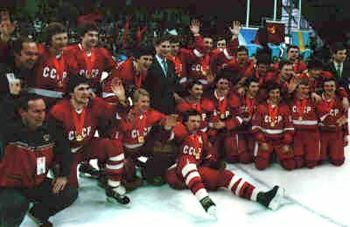 The 1988 Olympics concluded with another gold medal after finishing the tournament at the leading scorer and Krutov finished his international career in style with his fifth World Championship gold in 1989. Krutov's final medal count shows nine gold medals, three silver and two bronze, which included at least one gold at each of the World Juniors (2), World Championships (5) and the Olympics (2) as well as winning a Canada Cup. 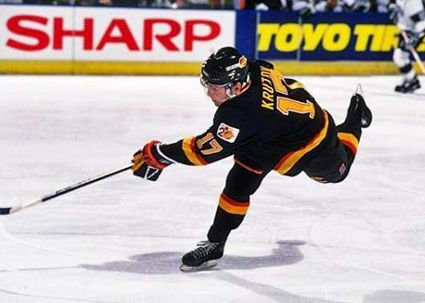 Kutov was one of the first wave of Soviet players allowed to join the NHL, playing for the Vancouver Canucks, who had drafted him in 1986 in hopes that he would some day be allowed to leave the Soviet Union. He played just one NHL season, 1989-90, scoring 11 goals and 34 points in 61 games while faced with the challenges of being a veteran trying to adjust to the change to a new language and culture while being viewed by some as taking a job away from a Canadian, plus the sudden riches combined with the freedom he was afforded in North America after an entire career in which he was required to train 10 months out of the year. 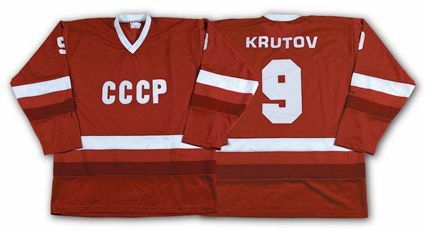 It was unfortunate that Krutov's attempt to play in the NHL was viewed as unsuccessful since it tainted many North American opinions of Krutov based on just a single season late in his otherwise stellar career in the Soviet Union. He played very little hockey in 1990-91, just one regular season game and three playoff games with the ZSC Lions in Switzerland. After another season with ZSC where he scored 32 points in 28 games, he moved to Östersund IK in the third division of Swedish hockey, helping them earn promotion to the second division on his first try, scoring a dominant 25 goals and 49 points in just 19 games. He would play two more seasons for Östersund and wrapped up his career with Brunflo IK before retiring. Krutov was named to the Soviet Hockey Hall of Fame in 1981 and the International Ice Hockey Federation Hall of Fame in 2010. Today's featured jersey is a 1986 Soviet Union National Team Vladimir Krutov jersey as worn during the 1986 World Championships. The Soviets arrived at the tournament with a striking new design unlike anything in the history of their national team, dating back now 35 years. Attention getting enough was the prominent red stripe running down each arm, which served as a background to highlight the Adidas stripes to an even greater degree than the previous 1985 style, but what really made this a stunning departure from any prior Soviet jersey were the bold, asymmetrical red triangles which simply screamed "LOOK AT ME!" in a way no Soviet jersey had ever dared before. 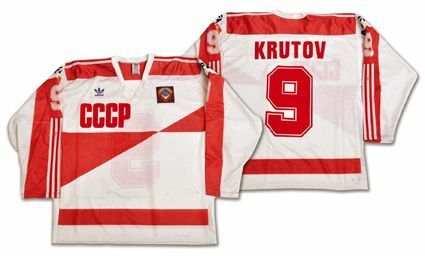 Bonus jersey: Today's bonus jersey is a 1987 Soviet Union National Team Vladimir Krutov jersey as worn by Krutov during Rendez-vous '87, a two-game series held in Quebec City on February 11 and 13, 1987 which replaced that season's NHL All-Star Game and featured a team of NHL All-Stars against the Soviet National Team. Game 1 went to the NHL All-Stars 4-3 and the Soviets came back to win Game 2 by a score of 5-3 in which Krutov scored a pair of goals, including the game winner at 9:19 of the third period. This jersey is much more typical of the Soviet style, with a minimum of adornments and simple one color names and numbers, made to look even more spartan when compared to the flashy NHL All-Star jerseys it competed against. Today's video section begins with Krutov scoring against the Montreal Canadiens on December 31, 1982 in an exhibition game. Here Krutov scores for the Soviets in Rendez-vous '87 to put the Soviets ahead 2-0 followed by his game winning goal to make it 4-2 on the Soviets way to a 5-3 win. In some truly rare footage, Krutov scores on a penalty shot for the ZSC Lions in Switzerland. Notice how the ZSC logo is a variation on the logo used by USA hockey.